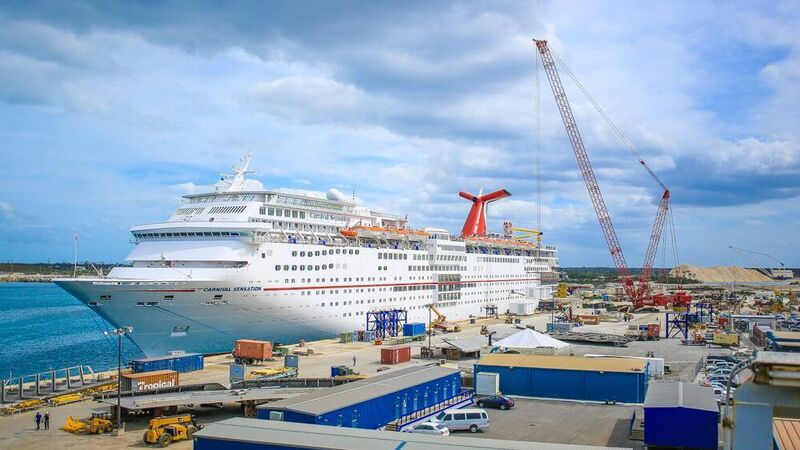 Grand Bahama Shipyard (GBS) has booked a total of 23 cruise vessels for dry dock maintenance in 2017, including work completed on 17 ships during the first half of the year. Generally, the scope of work included significant propulsion and technical systems overhauls, hull treatment, accommodations and public spaces upgrades and the addition of onboard attraction facilities. Carnival Cruise Lines dry docked five vessels to close their 2016-2017 dry dock season. Each dry-dock project involved full hull blasting and application of silicone coatings; major technical projects, including major steel replacement in underwater areas and pipe replacements on multiple systems throughout the vessels. GBS supported the overhaul of thrusters and stabilizers, as well as the fabrication and installation of sea chests to support the requirements of newly installed scrubber systems. Other major technical projects were the positioning of additional diesel generator modules (ADG) on four vessels and the installation of cyclo-convertors, the latter being a major co-op project with GBS/ABB/Carnival. On the hotel side, GBS supported the Carnival Hotel Refurbishment Team with interior structural modification works on several vessels and the construction and installation of the “Water Works” attraction. The five vessels were the Carnival Ecstasy, Dream, Sensation, Glory and Breeze. 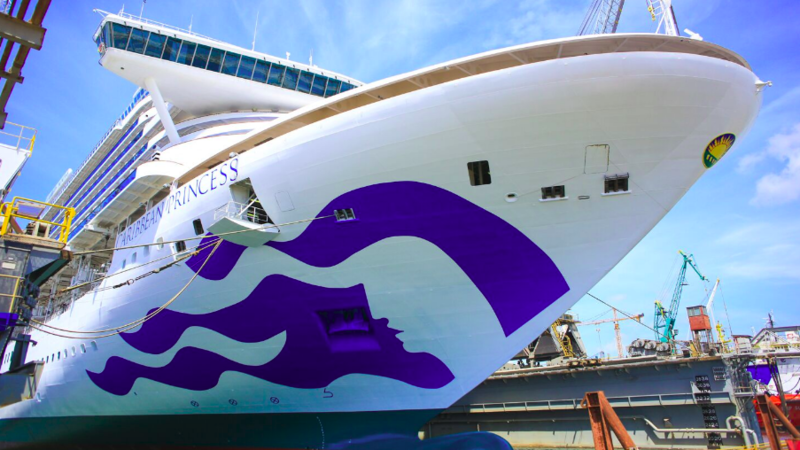 Royal Caribbean Cruise Lines’ Grandeur of the Seas received a scrubber system, enhancements to aluminum and steel structures of the upper deck, and complete hull blasting and application of silicone coating. A project of note undertaken by the yard was the erection and maintenance of an impressive 1500 cubic meter complex scaffolding structure to support interior renovations. Princess Cruise Lines returned with two vessels, the Caribbean Princess and the Pacific Princess. Both replaced approx. 11 tons of steel in structural projects on the hull and upper decks. Other projects of note included the application of the intricate Princess livery on the bow of each vessel by a highly skilled team from the GBS Hull Treatment Department. Celebrity Cruises’ Celebrity Summit visited in April for a major Rolls Royce Mermaid Pod overhaul. The yard team are so versed in this work that the vessel was ready to return to operations within seven days of going dry. Norwegian Cruise Lines dry docked five ships within the first half of 2017. NCL’s Norwegian Sky dry-docked for works that included UTM on pool structures and replacement of galley equipment. GBS supported Rolls Royce on the overhaul of CPP and thrusters, and GBS further assisted by constructing and maintaining complex scaffolding in support of interior renovation projects. The Norwegian Pearl and Norwegian Jade underwent extensive work programs included full blast and application of silicone coatings, the installation of new ballast water treatment system pipe lines; the overhaul of thrusters, stabilizers and ABB Azipods®. On the world stage, Grand Bahama Shipyard leads the way in organizing and supporting ABB Azipod® and ABB Fixipod® overhauls. Disney Cruise Lines docked the Disney Fantasy for its first class-related dry docking. Works included an extensive hull treatment and anode replacement program, along with the erection and maintenance of a 10,000 cubic meter complex scaffold stage to support major water park and slide refurbishments. Oceania’s Insigina and Regent’s Seven Seas Mariner both visited for a quick refit. For a comprehensive view of services offered at Grand Bahamas Shipyard, along with technical information for ship owner/operators and superintendents prior to dry dock, please visit www.grandbahamashipyard.com.